Magic 2014 is a perfect introduction for those players that are looking to get into the game or as a refresher for those that may have stepped away for a few years. The Core Set comes in 15-card boosters, Fat Packs (with 9 packs and a spindown counter), and Intro Decks. The Death Reaper deck is black and red, and has a heavy undead presence alongside the Bogbrew Witch, which allows players to pay 2 mana and tap the creature to bring out two other cards from the deck – Festering Newt and Bubbling Caldron. Old favorites like Sengir Vampire and Smelt are included as well for vanquishing one’s foe or removing a pesky creature from the game. 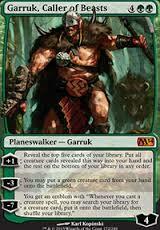 Other strong cards from this set include new versions of Garruk (Caller of Beasts) and Chandra (Pyromaster). Garruk, Caller of Beasts allows players to dig into their deck for creatures, place those creatures onto the battlefield, and allow those creatures to multiply. Chandra, Pyromaster dings players and creatures alike, exile cards from one’s library, and even copy their favorite spell three times. The returning Slivers have evolved to a greater strength – the buffs provided are cheaper than they have been (Galerider Sliver provides flying for 1 blue mana), are stronger (Bonescythe Sliver gives double strike in white ), and are in a variety of colors (Syphon Sliver provides lifelink in black, Thorncaster allows Slivers to ping in red, and Megantic Sliver gives all Slivers a Giant Growth. The typical boons (pay 1 mana, gain 1 life) have been similarly changed to allow players to gain 1 life if one casts a spell of the proper color or plays a land that can be tapped for that color. Check Magic 2014 out today, and the Theros block in the months to come.